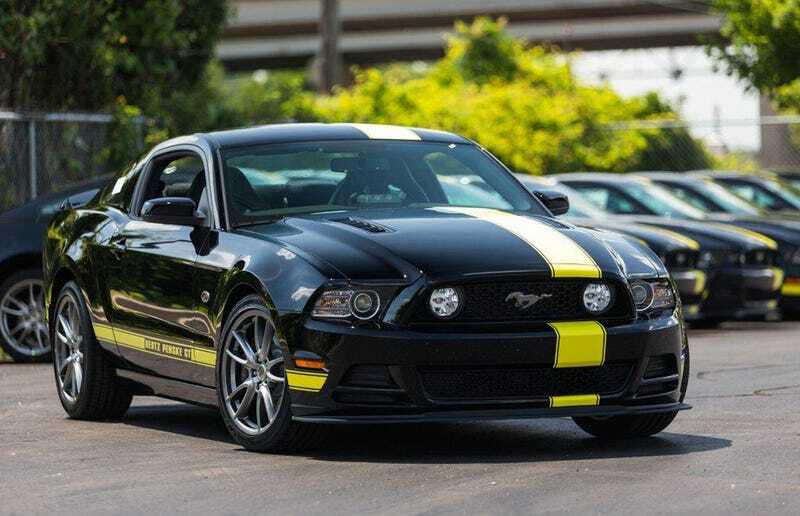 So Hertz is adding a special edition, Hertz/Penske Mustang GT to their fleet. And I think it looks absolutely awesome. Honestly the only thing I don't like about it is the Hertz lettering on the side stripes. That, I could do without. What do my fellow Opponauts think? More detailed information is available by reading the press release below. Hertz And Penske Racing Team Up To Introduce The Special Edition "Hertz Penske GT"
PARK RIDGE, N.J.— The Hertz Corporation (NYSE:HTZ), the world's largest general use airport car rental brand, and Penske Racing, today introduced the special edition "Hertz Penske GT." The Penske-inspired Ford Mustang GT, with a 5.0 liter V8 engine, joins other American muscle cars in the Hertz Adrenaline Collection and features performance upgrades to give consumers an exhilarating driving experience. The exclusive, limited edition vehicle is available at select U.S. airport locations and was introduced on Friday, July 5, at Subway Firecracker 250 Powered by Coca-Cola NASCAR Nationwide Series race at Daytona International Speedway. "Working with Penske Racing, we're excited to introduce the Penske-inspired vehicle as the newest in a long line of American muscle cars in our rental fleet," commented Mark. P. Frissora, Hertz Chairman and CEO. "There's nothing more thrilling than hitting the open road in a high-performance, American-built sports car. With this addition to our Adrenaline Collection, we are introducing a vehicle with race car performance enhancements to give customers a unique travel experience." In January, Hertz and Penske Racing entered into a multi-year agreement with Hertz serving as a 2013 primary sponsor for select races on the No. 22 Penske Racing car competing in both the NASCAR Sprint Cup Series and Nationwide Series. The No. 22 Hertz Ford Mustang will race in a special livery mirroring the Hertz Penske GT in the New England 200 at New Hampshire Motor Speedway in Loudon, NH on July 13. In its first race, the No. 22 Hertz Ford Mustang competed at Dover International Speedway on June 1 with Penske Racing's Joey Logano winning the event for his third-consecutive victory at the Monster Mile in the NASCAR Nationwide Series and his first Nationwide Series win driving for Penske Racing. At Dover, Logano took the lead for the final time following a two-tire pit stop with just 36 laps to go. Logano led 66 of the 200 laps and, over the final run, he was able to pull away from the field, earning his first Nationwide Series win of the season. It was Logano's 19th-career Nationwide Series victory and the 199th series victory for Ford Racing. Hertz is also an associate sponsor for the Penske Racing No. 22 Sprint Cup Series and Nationwide Series teams and has a branding presence on the team's uniforms and equipment as well as on the Nationwide Series car. The Hertz Penske GT joins a list of custom performance Hertz vehicles that started with Carroll Shelby in 1966 with the Shelby GT350H in the Hertz Rent-A-Racer program. From there, Hertz developed a 40th anniversary Shelby GT-H in 2006 and a custom Chevrolet Corvette ZHZ in 2009. Hertz is committed to offering the most technologically innovative products and services available to keep customers "Traveling at the Speed of Hertz." This includes Hertz 'Carfirmations'; 'Gold Choice', which gives Gold members the power to keep the car they reserved or simply choose a different car from the Gold Choice area; and e-Return, the fastest car rental drop-off that includes an email receipt. These are all complimentary services for Hertz Gold Plus Rewards members, which is currently free to join. In addition, Hertz continues to expand the presence of its ExpressRent Interactive Kiosks that let customers rent a car, with or without a reservation, through a live, face-to-face video kiosk. Visit www.Hertz.com and/or follow Hertz at www.Facebook.com/Hertz and www.Twitter.com/Hertz for more information. Click here to visit the Hertz YouTube page and view the Hertz ExpressRent Kiosk. Penske Racing is one of the most successful teams in the history of professional sports. Competing in a variety of disciplines, cars owned and prepared by Penske Racing have produced 370 major race wins, 428 pole positions and 24 National Championships, including the 2012 NASCAR Sprint Cup Series title. The team has also earned a record 15 Indianapolis 500 victories in its storied history. For more information about Penske Racing, please visit www.penskeracing.com. Hertz operates its car rental business through the Hertz, Dollar and Thrifty brands from approximately 10,400 corporate and franchisee locations in North America, Europe, Latin America, Asia, Australia, Africa, the Middle East and New Zealand. Hertz is the largest worldwide airport general use car rental brand, operating from approximately 8,800 locations in approximately 150 countries. Hertz is the number one airport car rental brand in the U.S. and at 111 major airports in Europe. Dollar and Thrifty have approximately 1,580 locations in approximately 80 countries. Hertz is an inaugural member of Travel + Leisure's World's Best Awards Hall of Fame and was recently named, for the thirteenth time, by the magazine's readers as the Best Car Rental Agency. Hertz was also voted the Best Overall Car Rental Company in Zagat's 2013/14 U.S. Car Rental Survey, earning top honors in 10 additional categories, and the Company swept the global awards for Best Rewards Program and Best Overall Benefits from FlyerTalk.com. Product and services such as Gold Plus Rewards, NeverLost®, and unique cars and SUVs offered through the Company's Collections, set Hertz apart from the competition. Additionally, Hertz owns the vehicle leasing and fleet management leader Donlen and owns a leading North American equipment rental business, Hertz Equipment Rental Corporation, which includes Hertz Entertainment Services.